In almost every newsletter release at the end of and during the beginning of the year, there are calls for suitably qualified individuals to join Non-Profit Organisation (NPO) Boards, normally on a purely volunteering basis – no board emoluments and occasionally the only benefit would be for travel and accommodation for meetings. So it is normal for mid-career individuals to “try this out” just to spice up their career profiles. You will get the most impressive resumes and during interviews the shortlisted candidates will exude a lot of energy, enthusiasm and eloquence that will throw the interviewers off the main focus for the positions. Serving in an NPO Board is sharply different from sitting in a corporate boardroom. Whilst the overall goal in the corporate sector is the enhancement of shareholder value (it’s about the money), objectives for NPOs are more complex; they involve the communities, the natural environment, service delivery, animal welfare amongst other objectives. An excellent corporate board member can be the worst if put in an NPO set-up and vice-versa. 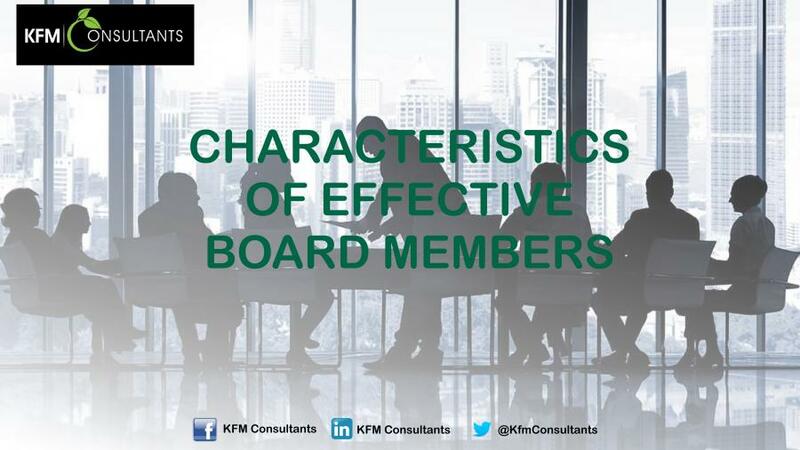 There are particular characteristics that should be looked at when appointing members for NPO Boards. Passionate about the cause: There is nothing worse than a board member for an environmental organisation who owns a manufacturing plant that pollutes a nearby water body, or a board chairperson with proven paedophilic convictions serving on a child protection organisation’s board. Well maybe these are extremes but the point is if you are not passionate about something, you will be less inclined to work hard for it. Sure, there are plenty of professional fundraisers and wealthy individuals you could ask to sit on your board, but how many are truly passionate about your cause? Interest in the cause is the foundation that every prospective board member ought to have. There is no exception to this rule. Forward thinking: Looking for candidates who have a “forward” mindset will help your nonprofit in the long run. These candidates are outside-the-box thinkers who look for solutions to problems you might not even know your organization has. They want to grow the cause and will help push the rest of your board on vision changes and innovations when necessary. Open-minded: In a group setting with many different viewpoints, keeping an open mind allows for healthy communication. Board members that come in with an open mind are far more likely to empower other board members to express their point of view and work toward solutions. Meeting commitment: I often get an annoying feeling when I the meeting chair asks for corrections to last minutes and some members present appear clueless and even start reading the minutes at that time, giving excuses such as “It must have been sent to my email spam”. A good board member is one who will commit to prepare for meetings on time. Another show of commitment is the consistent presence at board meetings. These are usually held only periodically, normally every quarter; surely a committed member can properly synchronise their calendars to be present for at least 75% of the time. Natural givers: Some corporate board members would be concerned with “What’s in it for me?”. For NPO Boards it is more about “What can I give towards this cause?”. A good NPO Board member is one with ability or propensity to give of their resources towards the cause. Takes responsibility for outcomes: A position that gives major decision-making powers to any individual comes with a great deal of responsibility. Look for candidates who have a record of taking responsibility in decision-making environments, especially in team settings, when things have gone well and when they’ve gone wrong. Communication skills: Board members are not only the governing body of your non-profit, they are also partly the face of your organization. They communicate with large donors, they make speeches on behalf of your non-profit, and they make statements to the media. Effective communication skills are definitely desired for any prospective board member. Respectful of others: It’s impossible to act in a team setting if members of the team don’t respect one another. While this also seems like a self-evident trait to look for, some are better at disguising their lack of respect than others. Before making a decision on a new member for your board, look out for these warning signs of disrespect, such as interrupting or consistent tardiness, so you can weed out those who won’t mesh with the team when it matters most. A willingness to learn: “The more I learn, the more I realize how much I don’t know.” This is my favorite quote from Albert Einstein. It perfectly encapsulates the mentality that your prospective board members need to bring to the table. A willingness to learn will encourage others on your board to express their viewpoints and share their experience, knowing that another board member is open to learning from others. The above characteristics are not exhaustive of what you should desire for your NPO, but these should get you thinking and come up with more characteristics relevant for your organisation.